The Group awarded as “2012 Outstanding Supplier” by Schindler Elevator. The Group also awarded for the commitment to sustainability. 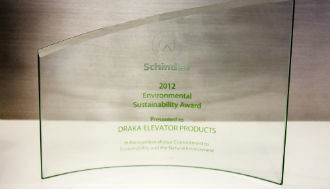 Prysmian Group, through its brand Draka Elevator, was awarded as “2012 Outstanding Supplier” by Schindler Elevator Corporation which is the 2nd largest elevator company in the world. 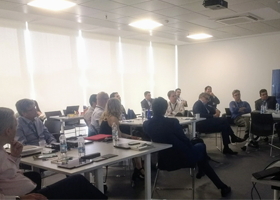 Schindler conducted their annual Supplier Day at their North American headquarters in Morristown, New Jersey, last March. This makes the third year in a row that Group’s Elevator Business Unit has been honored with such an award from this valued customer. Prysmian Group is the only Schindler’s supplier to achieve this exemplary record. In addition to recognizing suppliers for outstanding quality and service, Schindler included achievement in Environmental Sustainability with their first annual “Environmental Sustainability Award”. The focus was on initiatives in 2012 where a supplier would complement or directly contribute to the five focus areas of Schindler’s own environmental Policy which includes continual improvement, pollution prevention, suppliers, communication and training. The Group was pleased to be selected the recipient of this first annual 2012 Environmental Sustainability Award for the “Commitment to Sustainability and the Natural Environment”. Along the various stages of E3 program, the Group has increased energy efficiency and sustainability thanks to a smarter and more efficient green workforce, imparted valuable skills training and promoted innovation among employees, improved profitability of the local economy and enabled growth. 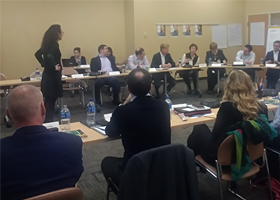 In general, the E3 program allowed the Group the reduction of environmental impacts gaining a competitive advantage thanks to the carbon footprint assessment, the decrease of contribution to landfill, comprehensive waste management program. Prysmian Group has also embarked on promoting sustainable partnerships with suppliers via developing environment friendly products including special energy efficient packages (I2 LED lighting) for new and modernization of elevator cabs for the industry.